In the recent times water sports have rapidly gained traction among the masses, and have seen their viewership expand exponentially. Swimming in particular has attracted an increased number of youth. This can be partly attributed to the fast pace of the sport and the increased avenues of sports betting. Betting on swimming is perhaps less well-known than most other kinds of sports betting but the basis is the same and with its relative lack of popularity, which is nonetheless growing considerably, it’s a good place to get your feet wet (if you pardon the pun) in the overall world of sports betting. The idea is simple: you bet on the outcome of any given swimming event through a reputable online bookie and if your predictions are correct, you win multiples of what you bet, depending on the odds. Still, to get things started, it’s not a bad idea to take up some free-bet offers to get the full lay of the land. Hungary in particular has had a fair share of legends that have left their mark in swimming and bagged several gold medals for the country. Here is a list of the 6 most successful swimming personalities from the country. One of the stalwarts of his game, Ervin represented Hungary in the much anticipated 1956 Summer Olympics in Melbourne in water-polo. This Olympics was right after the Hungarian Revolution in the same year. Ervin’s performance helped the team win, what is often called the “Blood in the Water” match. In a fiercely fought bout where several players were injured, the Hungarian team scored 4-0 against the Soviet team and won the Olympic gold. Johnny was born in the present day Romania, which was a part of the erstwhile Austro-Hungarian Empire. He started swimming when a doctor suggested that this physical activity might help him to cope with his polio disease. Starting from humble beginnings, Johnny had to migrate to USA at a very young age. He went on to win five gold medals in swimming Olympic Games and a bronze in water polo in the 1924 Paris Olympics. Johnny is remembered as a successful actor of his times and is best known for his role in the Tarzan movies. One of the most well-known swimmers of the modern era, Krisztina is a three time Olympian and has gifted Hungary with 5 Olympic gold medals. She was the first female swimmer to win gold medals for her country. At a very young age of 22 she decided to retire from the competitive swimming. 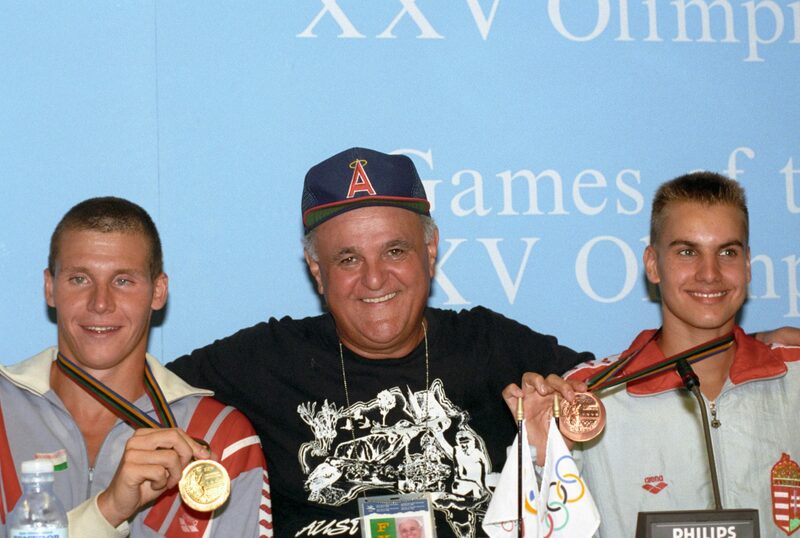 In 2001, the Hungarian was inducted into the International Swimming Hall of Fame. One of the greatest swimmers of all times, Tamás won 4 Olympic gold medals for Hungary. He also holds the record of being the first swimmer to finish the 200 m medley within two minutes. Having several honours to his name, he wanted to encourage young children into the sport and started a successful swimming school in Budapest. Known as the “Iron Lady”, this competitive swimmer has won 7 gold medals for Hungary in the Olympics. Katinka holds world records in each of the five medley events, and gained the image of a highly versatile sportsperson. She was conferred with the FINA’s Female Swimmer for three consecutive years – 2014, 2015, and 2016. The six time Olympic medallist is one of the most decorated athletes in Hungary. László took inspiration from his father who was also an Olympic swimmer. He has been the Hungarian Swimmer of the Year for 9 times and holds the European record for 200-meters butterfly race in the 2008 Beijing Olympics.